Charlotte 49ers head football coach Brad Lambert has promoted Johnson Richardson to assistant coach. Richardson, who served as an offensive intern last year, will maintain his role as tight ends coach. Lambert also announced the addition of Aaron Curry to the coaching staff. Curry, a former NFL star who played for Lambert while at Wake Forest, was brought onto the coaching staff as a defensive graduate assistant. He served as strength and conditioning intern last year. 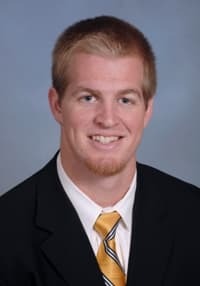 Richardson, a tight end at Wofford from 2006-10, had served as tight ends coach/offensive graduate assistant for two years at Wingate (2011-12). A 2010 Wofford grad, Richardson was a member of the institution's 2007 Southern Conference Championship team. He attended Charlotte’s Providence Day High School and played in the All-Star Shrine Bowl Classic. He also is the grandson of Carolina Panthers owner Jerry Richardson. "He’s an extremely hard-worker and the type of person we want representing the University," Lambert said. "He’s done an great job over the last two years -- not just on the field with the tight ends but also in recruiting. We’re excited to have him as a full-time coach. It’s been a lot of fun to watch him grow and mature as a coach. He’s got a bright future ahead of him in college coaching." This past year, Richardson worked with halfbacks C.J. Crawford and Justin Bolus, in particular. Crawford, who was a senior, shared the team-high with six touchdown receptions. He made 31 catches for 364 yards, averaging 11.7 per catch and 33.1 per game. He and Bolus combined for 43 catches, 520 receiving yards and seven touchdowns. Crawford added 47 yards rushing. Curry, the 2008 Butkus Award winner and the fourth pick in the 2009 NFL Draft, played four seasons in the NFL with the Seahawks and Oakland Raiders. A two-star recruit out of Fayetteville’s E.E. Smith High School, he became a first team all-America linebacker at Wake Forest and won the Butkus Award as the nation’s top linebacker. He retired from the NFL in August of 2013 and joined the 49ers strength and conditioning staff shortly thereafter. He graduated from Wake Forest in 2009 with a degree in Sociology. "Obviously, we have a long history with Aaron, and we’re fired up to have him on our staff and out there on the field with our guys," Lambert said. "He understands the work ethic it takes to develop as a player and he knows what we expect. His experience and knowledge will benefit our guys, especially on the defensive side of the ball. He’ll primarily be working with the linebackers but he will be touching all aspects of our defense." Richardson fills the assistant coach position vacated when inside linebackers Drew Dayton resigned. Lambert will take over the everyday duties as inside linebackers coach. Charlotte will begin its spring practice, Tuesday, March 11.